Just placed an Amazon order for all sorts of household stuff and whatnot. 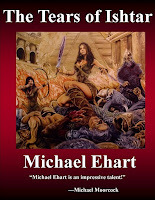 Part of the whatnot are several books; Sojan by Michael Moorcock, Battle in the Dawn by Manly Wade Wellman and The Tears of Ishtar by Michael Ehart. 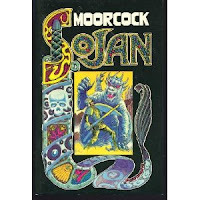 I've never read any of the Sojan stories Moorcock wrote when he was as young as 17. I have read a story series by Wellman and Ehart and thought they rocked. In all three cases I pretty much can't wait to get the books in my paws. 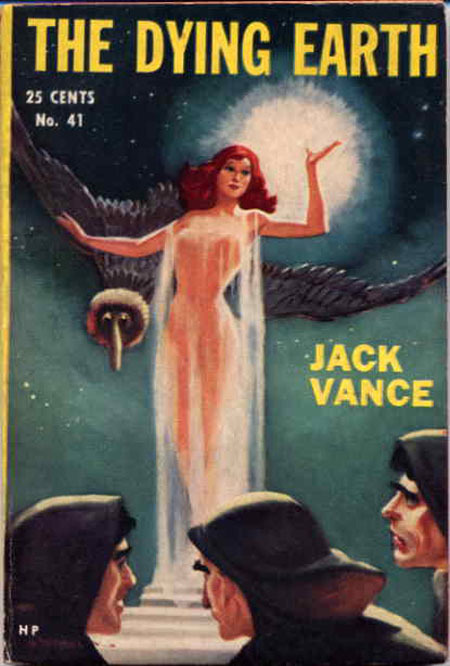 Manly Wade Wellman was a master of many genres, from horror to science fiction to regional. The stories of John the Balladeer and his fight against folk monsters in Appalachia are as fresh and wondrous today as when the first story, "O Ugly Bird" was published in 1951 (like I've said with other stories; if you haven't read these you owe it to yourself to do so). What I doubt most people know is he also provided two additions to the field of swords & sorcery. The first is the fighting caveman Hok (recently collected by the magnificent Paizo for the first time). The second is Kardios, accidental destroyer and sole survivor of sunken Atlantis. 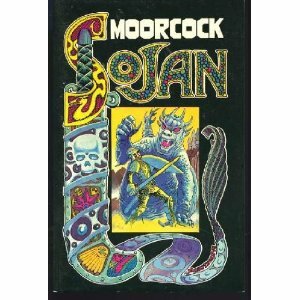 These latter stories were produced mostly for Andrew Offutt's "Swords Against Darkness" anthologies in the seventies. 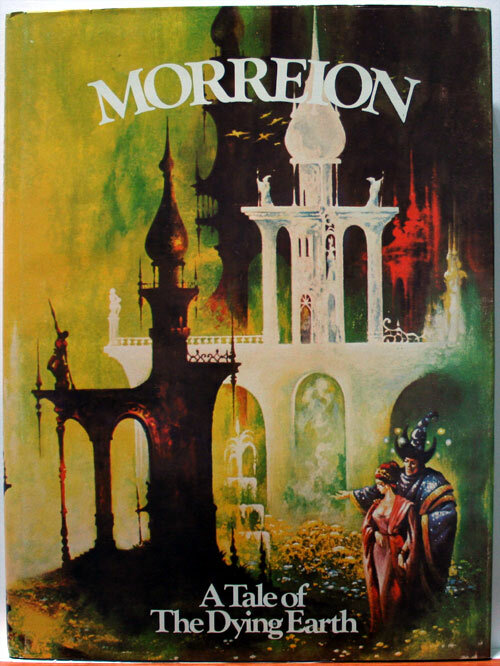 The second to last was included in Gerald Page's "Heroic Fantasy" collection in 1979. Written in the heyday of the genre, these stories, are playful and wry commentaries on mankind's willingness to enslave itself to self proclaimed gods and the acquisition of wealth and power. Kardios is a harpist with long black hair, a strong, bronzed muscled physique and little fear. Post destruction of Atlantis he wanders the world simply seeking out what's new and unknown to him. Seeking to better himself he left the forests and woods of his back hills home and set off to the "gold and jasper palace" of the seemingly ageless Queen Theona. Overhearing his singing to her advisers she invited him in and asks him to sing for her. The song he sings for Theona is about her and a prophecy that says when she "grants to a lover the boon of a kiss, Atlantis, Theona, will drown in the sea." Theona simply laughs off the warning and asks Kardios for a kiss. He gives her the kiss and the earth quakes and the seas spew up and Atlantis sinks beneath the waves. 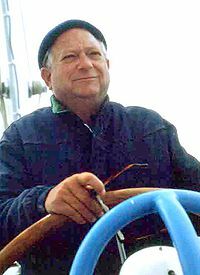 There are but five stories telling us of Kardios' life and adventures. The first, "Straggler from Atlantis" introduces us to our hero and tells of how he washes ashore on a coast populated by friendly giants and an inimicable traveler from the stars. Here Kardios gains his sword of iron. This comes to serve him well in his following adventures letting him get around creatures unable to be hurt by mortal weapons. The rest of the tales, "The Dweller in the Temple", "The Guest of Dzinganji" "The Seeker in the Fortress", and "The Edge of the World", follow similar arcs to one another. Kardios comes across something strange and hazardous to his health. Through his wits, charm, a dash of luck, and nigh magical sword defeats it, be it old god, old sorcerer or old social customs. For all the inventiveness and action there's never any real sense of danger. Kardios never really seems to be at risk of getting hurt let alone dying. Nonetheless, the stories are fun. Time and again, Kardios is drawn in to situations where people, be they lotus-eating urbanites or gold seeking travelers, have allowed themselves to become snared by greed and fear. They have made accommodations to dire circumstances or beings in order to hold on to wealth or simply their lives. Kardios is able to detect these things, and, also, with sword and courage, pare away the black deals and devilish compromises to some sort of freedom. Which I think was a large part of what Wellman was doing with these stories. The stories aren't deeply philosophical tracts or anything. They're still about a sword swinging harpist fighting monsters and what have you, but, there is a little something else going on. The stories are also much earthier than anything else I've written about before. Queens, princesses, mechanical women, amazons and chamber maids all fall at Kardios' feet and are willing to (and in some cases do) fall into his bed. And it's all fairly believable. His charm and dash are as real as they can be on a the printed page. Unfortunately, it's tough to come by all these stories at this time. They've never been collected and I can only hope the good people at Paizo are listening. Right now you have to track down the Swords Against Darkness books (which you should have anyway, people) and Heroic Fantasy. Three stories, "Straggler of Atlantis", "The Dweller in the Temple" and "The Seeker in the Fortress" can be found in three of Isaac Asimov's Magical World of Fantasy collections. Still, you're looking at about fifty bucks on Amazon. Unless you feel a need to get the Swords Against Darkness anthologies (+ Heroic Fantasy) you're probably best waiting till some nice publisher binds them together for you. 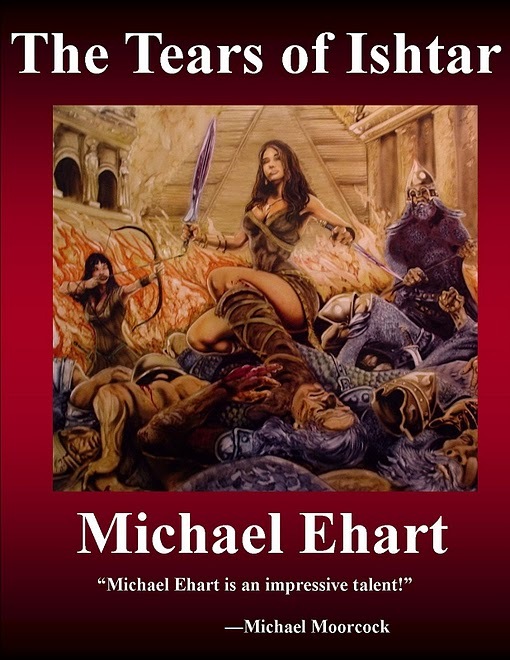 Not all swords & sorcery has to be Howardesque sagas with blood pumping action and grim heroes. 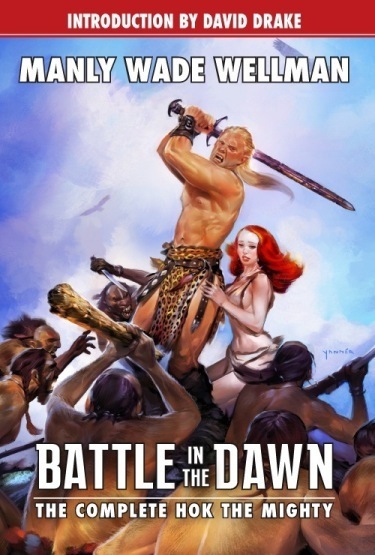 Sword wielding men and women do tend to dominate the genre, though. Even the humorous escapades of Fafhrd and the Gray Mouser are filled with dashing swordplay and the elemental-commanding Elric is pretty much synonymous with his cursed sword Stormbringer. 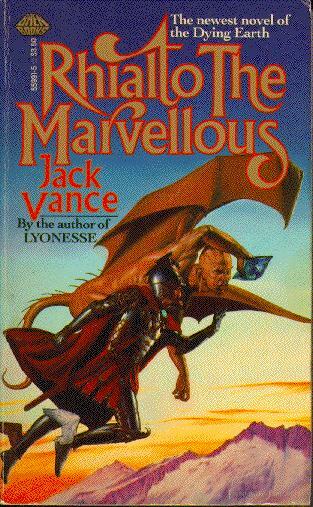 Fortunately there's plenty of enough room in the genre for the darkly-humored and cynical tales of "The Dying Earth" by the inimitable Jack Vance (whom the New York Times wrote about in 2009). There is little swordplay and much spell flinging. The conceit of a dying earth, the sun dimmed or extinguished, apparently has roots running back to the Romantic movement of the late 18th and early 19th centuries. Since then, from Lord Byron to H. G. Wells it has been used for varying authorial purposes. Mostly they used it to comment on the end of humanity and civilization. I think it was Clark Ashton Smith, though, who first hit on the idea of using it for a fantasy playground filled with a fin de siècle spirit in his tales of Zothique. 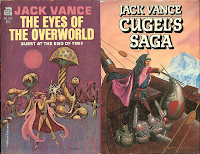 Armed with a vocabulary as esoteric, strange and wondrous as Smith's, Jack Vance, with the publication of "The Dying Earth" in 1950, provided the sub-genre with a name and initiated a series of uniquely strange stories. From the appearance of the first book through that of "Rhialto the Marvellous" in 1984, created a splendidly colored addition to swords & sorcery. 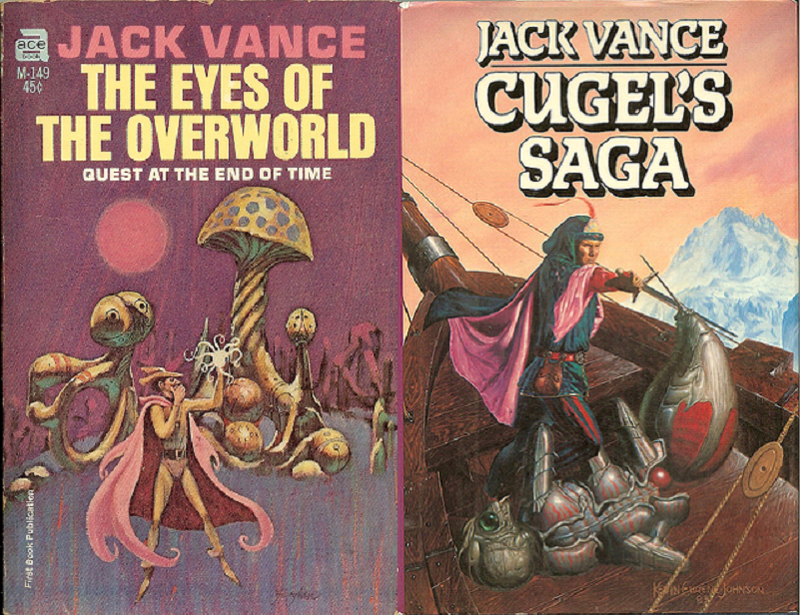 Following "The Dying Earth", Vance returned to the milieu with "The Eyes of the Overworld" in 1966. In it he introduced Cugel the Clever, an amoral figure of no nobility and no trustworthiness or worth at all, save as a vessel for Vance's witty dialogue and his critiques of human vanity, greed and callousness. He survives the danger his cupidity leads him into only to return for more in 1983's "Cugel's Saga". Two stories in that book appeared earlier in Lin Carter anthologies. In 1984 the last volume, "Rhialto the Marvellous" appeared (reviewed by Grognardia in 2010). It is composed of three stories, "The Murthe", "Fader's Waft" and "Morreion". All feature the mighty wizard Rhialto, called the Marvellous for the elegant cut of his clothing, including a "six-tiered black satin hat" and the flourish with which he wears them. Together with his wizardly brethren, including Haze of Wheary Water and Vermoulian the Dream-Walker, he faces off against opposing wizards, occasionally his colleagues and archveults from the planet Jangk. 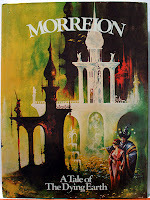 The final tale, "Morreion", was first published in Lin Carter's "Flashing Swords #1". Unlike that collection's opening story, "The Sadness of the Executioner", I love this one. It's filled with magical fights, scheming and sniping between Rhialto and the other wizards of Earth's 21st Aeon and a journey to the end of space and the nothing that lies beyond it. And it's presented in Vance's fun, ornate style. The story opens with the archveult Xexamedes digging for gentian roots in the Were Wood. While an archveult is never fully described we do learn they have blue scales, movable black plumes and stand over seven feet tall and are "slim as lizards". We soon learn the archveults were driven from the Earth in years past by the wizards, including Rhialto. In return for be allowed to flee with their lives they agreed to teach the wizards the secret of their IOUN stones. These magical gems orbit their owner's head and provide them a wide variety of magical enhancements. In order to secure this knowledge the wizards send one of their own, Morreion, to follow the archveults to their world. He was never heard from again and the secret was never learned. With the reappearance of an archveult and his capture by Hearark the Harbinger and the diabolist Shrue, the wizards are prompted to inquire once into the IOUN stones. The captured Xexamedes offers to provide the information but escapes. Following the archveult's escape and the destruction of his aviary, bird-women and servant by Gilgad's "Instantaneous Electric Effort" spell in the ensuing chase, Rhialto finds a leaf pinned to his doorway by a thorn. It proclaims "NOTHING THREATENS MORREION". Here's a taste of Vance's writing. Surveying the devastation wrought on his home by Gilgad's spell, Rhialto gives orders to his servant Puiras; "At midday prepare a meal for the Minuscules— gruel and tea will suffice. At sunset serve out the thrush pate. Next, I wish you to scour the tile of the great hall. Use no sand, which grinds at the luster of the glaze. Thereafter, clear the south sward of debris; you may use the aeolus, but take care; blow only down the yellow reed; the black reed summons a gale, and we have had devastation enough. Set about the aviary; salvage all useful material. If you find corpses, deal with them appropriately. Is so much clear?" The note leads to Rhialto and the other wizards struggling to determine what the note might possibly mean. They eventually decide that they must seek out Morreion and he must lie at the end of the universe. To prevent each other from securing an advantage regarding the IOUN stones they all decide to go. Their journey is conducted by means of Vermoulian's "peregrine palace", a glittering, turreted thing that can travel the reaches of space. To find their lost colleague they "travel through clouds and constellations..., past bursting galaxies and meandering star-streams; through a region where the stars showed a peculiar soft violet and hung in clouds of pale green gas; across desolation where nothing whatever was seen save a far few luminous clouds". Who and what the wizards find at the universe's end is for you to discover. Like "The Jade Man's Eyes" did for Michael Moorcock's Multiverse, "Morreion" does for Vance's Dying Earth. It serves as a perfect introduction, highlighting the conniving, self involved characters that Vance excels at creating and his stunning prose. There's an omnibus edition of the Dying Earth novels, called "Tales of the Dying Earth" that Orb published in 2000. You can get it for about eleven buck with shipping from Amazon used. 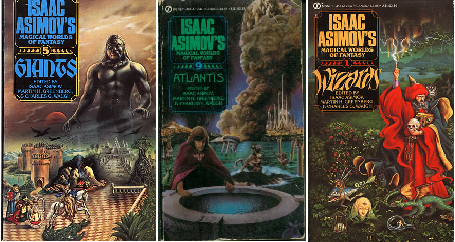 Any fantasy fan worth his or her salt should own these books.